We hope you had a great October! We just want to start off by thanking everything who came out to our big End of Season Sale. We had a great weekend, many of you walked away with some awesome new gear. We greatly appreciate your support and we look forward to seeing photos of you having fun in your new gear. This past month has been a lot of fun for us. We finished up our certification ocean dives where we certified another 45 students. We finished off the season with a few good boat dives and then finished off the month with our big sale. Back by popular demand, November is 50% off Equipment Labor! Drop off your gear anytime in November to receive the discount. We have booked another trip to Scuba Club Cozumel from January 30th – February 6th, 2016. Our last trip to Scuba Club was a huge success. The resort is made for divers by divers. This trip is all inclusive giving you 2 tank dives for 5 days, unlimited shore diving and all of your meals. Head over to ourwebsite to learn more. We just booked our semi-annual Bonaire trip for March 5th -12th, 2016. Head over to our Group Travel Page to learn more about this trip. Our go-to Dive Resort in Bonaire just finished a multi million dollar renovation. Not only have they revamped the resort lobby but they also added a new boat to their fleet along with a new restaurant. We are very excited to see the new changes in person when we head down there next week. Read all about the new upgrades here. The Vida Mask uses the latest in co-molding technologies to provide a mask with unique styling and color configurations. This two teardrop shaped lens mask provides tremendous vision and comfort in addition to the unique design. * Low profile & wide view allow the mask to fit on a wide variety of faces. * Silicone connected pivot buckle permit an extremely comfortable mask strap fitting. * The ergonomic nose pocket provides ease of clearing ears. The Froggies are getting ready for their Annual President’s Banquet. Friends and family are welcome to attend. Visit their event site for more details! As a lot of you prepare for your dive vacations this season, we have received many questions on diving and flying. Here is anarticle that gives you what you need to know in order to maximize your diving on vacation while remaining safe when you hop on the plane home. Blue Lobster Caught out of Beverly, MA! This lobster was caught near Halfway Rock in Beverly the other day by fisherman Tom Birarelli. Read the details of their find here. Call to schedule: We are flexible! Register for the January 30th -Feb 6th, 2016 Cozumel Trip on the sale days and your name will be entered to win an Aqualung ZUMA Travel BCD! This might be the best part of our October sale. We sell off our rental gear! That means you get practically new gear for half price! We fully clean and service all of the gear before we sell it. These items are always the first to go so make sure you arrive early on Saturday to make sure you get what you want! We have a few different deals for you when it comes to buying new tanks. *Don’t forget, we always give FREE VIPS FOR LIFE when you purchase a new tank from us. This card enables you to rent gear at half price for life! Air Cards: Buy in bulk and save! Purchase a $50 gift card and receive a $10 bonus card! Why should you buy new gear from us? Simple, FREE MAINTENANCE FOR LIFE. Every time you purchase a new piece of new equipment we will give you free labor and parts for life on that item. That way you know you gear is always clean and working properly for whenever you want to hop in the water. Akona has a great promotion going on right now until February 28th. Buy the 10lb Roller Bag and receive the small duffle bag FREE! We have everything in stock so don’t delay! The small duffle bag actually hooks on to the big roller bag for easy carrying. This carry-on weighs less than 3lbs. • Carry on duffel weighs less than 3lbs. • Two outer mesh pockets, two outer zippered pockets using a reversed nylon coil #5 zipper. or a pair of snorkeling fins. • Large U-shape opening to the main compartment. • Swivel snap hooks secure the adjustable shoulder strap. • Unzip the slip panel and stack your duffel on the top of the <7lbs or <10lbs roller bag for easy transporting. • 1½” webbing handles at each end of the duffel provide quick grab points. OVERALL DIMENSIONS: 21″ X 11″ X 1″, 2541 cu. in. Buy a New Aqualung BCD and get a Free Dry Bag! Great news for the holidays! Buy any new Aqualung BCD and receive a Free Dry Bag! BCD must be purchased between November 19th and December 31st, 2014. Don’t forget, you also get Free Annual Labor and Parts from us when you purchase any new piece of gear. So that’s even more savings in your pocket! Stop by the shop to view our line of BCDs. We would love to help you pick out a new BCD for yourself or the diver in your life. See the full Aqualung BCD lineup here. FREE Defense Duffle Dry Bag ($110 Value!) This item is new for 2015. Best the first to have one! We want to tell you a story about one of our customers, Fred. Fred came to us last September wanting to become a certified scuba diver. He walked in the door with such enthusiasm, telling us he had wanted to do this for years but had never took the plunge to get his certification. Fred completed his PADI Open Water Diver Certification on September 29th, 2013. Since that day, Fred has been hooked, diving every weekend he can and taking some days off to get in the water because he just couldn’t stand to be away. Fred hopped in the water on May 10th and said ” Let’s set a goal of 50 dives this season.” As he approached the 50 dives so early, he then decided to up the goal to 75. Once Fred hit 75 dives, Bob said if you get 100 dives in by your certification anniversary we are going to do something special for you. We obviously loved this idea of 100 dives and encouraged him to reach his mark. We saw him every weekend for air fills and he would update us of his dive count, what new skill he had mastered or what cool critter he saw on his dive that morning. “Today makes 74, I’ll be getting 2 more Saturday and hopefully 3 more dives in Sunday”. 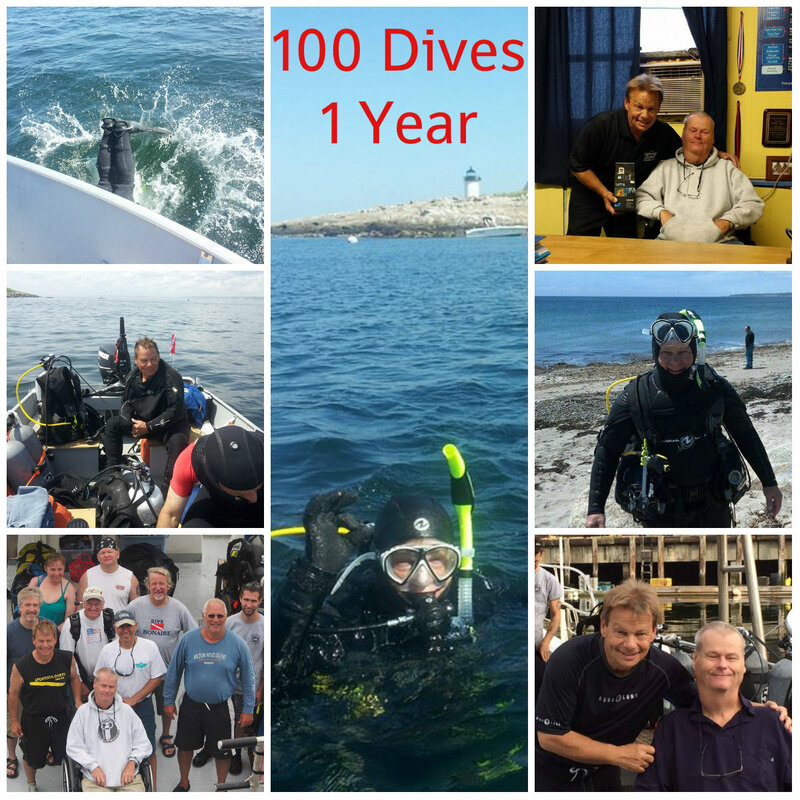 We are proud to announce that Fred made is 100th dive on September 29th, 2014! We were so impressed by his dedication to the sport and enriching his life, we knew we had to celebrate the occasion. Fred has always talked about getting a GoPro so he could document all of his great dives so he could show his friends how awesome the sport of diving was. So we figured what better gift than a GoPro to mark his great accomplishment. We have now dubbed Fred ” Diver of the Year”. We encourage others to follow in Fred’s footsteps. You could be the next Diver of the Year! Start your adventure today! Get ready for huge savings on October 18th & 19th! We are having our annual Fall Sale and we want you to get the best deals around. There will be 10-20% off storewide, package discounts, camera discounts and of course our rental gear will be sold off at huge discounts. Stay tuned for our full sale brochure which we will send out soon. Happy Diving! Aqualung is at it again. They have just released a new BCD, the PRO HD. This BCD will be taking the place of the PRO LT which we use in our rentals and love. So even though we are sad to see the PRO LT leave, the PRO HD is very similar but with some great upgrades we are excited to try out. The major changes that we see from the PRO LT to the PRO HD is that the PRO HD is now made of ResisteK material that holds up to the rigors of salt and chlorine while retaining its good looks. If you are tough on your gear, this would be the BC for you. Another upgrade are the 5 stainless steel rings for accessories. I find these to be a better shape, size and placement. The PRO HD features the Aqualung SureLock Weight System with additional tank trim pockets so no need for uncomfortable weight belts. The BC comes with accessory pockets with zippers as well as the scooped pockets for easy gauge/computer/octo storage. It has grommets for fixing a small BC knife to it (we recommend the Squeeze knife by Aqualung). Another great feature is the carrying handle on the backpack along with the traction pad to reduce tank slippage. It comes in 6 sizes (XS-XL) and one color (black/charcoal/blue). We have these in stock now, so stop by the store to try one on today! Be a HERO: GoPro’s have arrived! We are stoked to announce the arrival of our new GoPRO Cameras!!!! Although we love our SeaLife Cameras, we wanted to open up the photography department and add in the every popular GoPro. We have used them personally and obviously fell in love and wanted to share the fun with all of you. We will also be putting together a GoPro Instructional Class where we will teach you all of the features and how to use the camera while getting the best video and images possible. Stay tuned for the launch of the GoPro Course! Here is a list of what we currently have in stock for cameras and accessories. Come on down to the store to check out all the fresh equipment! …..so what we are trying to say is we have tons of accessories, even for non diving activities! Can I use a light with a GoPro? Yet another new product this month! We love rashguards, I mean who doesn’t. They are great for sun protection, abrasions from critters or coral and you can use them as an undergarment to easily slip your wetsuit over. We know that some people are not a fan of tight fitting clothing, so we jumped on the opportunity to carry the Loose Fit Rashguards. These come in both men and women’s sizes along with short and long sleeves. These are great for sun protection with their SPF 50 rating and are made up of 80% nylon and 20% spandex. These have a loose fit and low comfortable collar.